17 Gloucester is located on the NE corner of Commonwealth and Gloucester, with 15 Gloucester to the north, across Alley 427, 282 Commonwealth to the south, across Commonwealth, 273 Commonwealth to the east, and 20 Gloucester to the west, across Gloucester. 17 Gloucester (275 Commonwealth) was designed by Sturgis and Brigham, architects, and built in 1886-1887 by D. Connery & Co., builders, for banker Eugene Van Rensselaer Thayer. Eugene Thayer purchased the land for 17 Gloucester on January 16, 1886, from Augustus Hemenway. It had changed hands several times and originally was part of one of several parcels purchased on January 29, 1866, from the Boston Water Power Company by a real estate investment trust formed by John Templeman Coolidge, Franklin Evans, and Charles Henry Parker. The trust had subsequently subdivided the parcels into lots, which it sold to investors and builders, who then frequently resold the lots to others. Click here for an index to the deeds for 17 Gloucester. The house was completed by the 1887-1888 winter season and Eugene Thayer and his wife, Susan (Spring) Thayer, made it their home. During the previous season they had lived at 151 Commonwealth. They also maintained a home in South Lancaster. 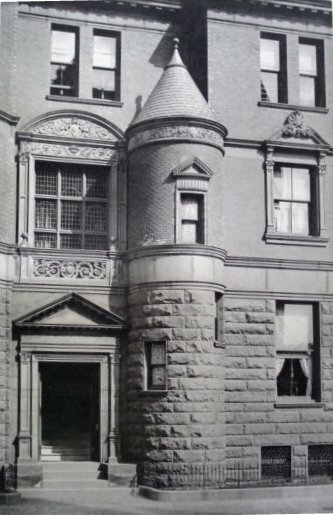 The Thayers continued to live at 17 Gloucester during the 1895-1896 winter season; by 1897, but moved thereafter to 415 Commonwealth. On August 26, 1896, 17 Gloucester was purchased from Eugene Thayer by Mabel De Carteret (Hunt) Slater, the wife of textile mill owner Horatio Nelson Slater and daughter of William Morris Hunt, the noted artist. They lived at 17 Gloucester from the 1896-1897 winter season. They previously had lived at 315 Dartmouth. They also maintained homes in Bar Harbor and Magnolia, as well as in Webster, where several of his cotton mills were located. Horatio Slater died in August of 1899. Mabel Slater continued to live at 17 Gloucester. She was an inventor, filing various patents with the proceeds to go to charity. In 1904, she patented a method of obtaining ice-cooled water from a spigot installed into an ice-box refrigerator, and in 1914, a gauge to show how much ice was left without having to open the ice-box. She also invented a sleeping bag that doubled as a garment, said to have been used in World War I. On October 3, 1900, Mabel Slater was injured in a gas explosion at the house. She moved soon thereafter, living at her homes in Webster, Bar Harbor, and the Readville district of Milton. 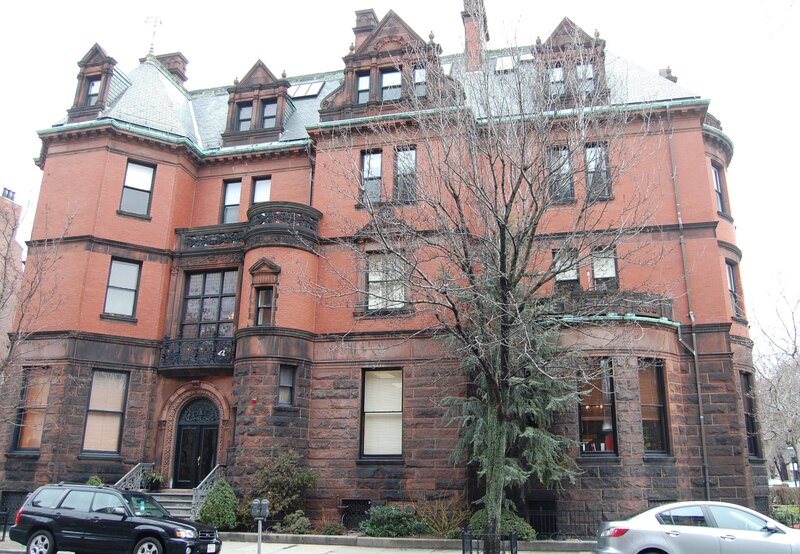 She appears not to have maintained a home in Boston again until the spring of 1913, when she purchased 448 Beacon. On May 23, 1901, 17 Gloucester was acquired from Mabel Slater by Maria Antoinette (Hunt) Evans, the wife of Robert Dawson Evans. He was president of the American Rubber Company of Boston and from 1896 was president of the US Rubber Company. He also was a significant investor in mining. After acquiring the house, the Evanses engaged Peabody and Stearns to design a significant remodeling of the house. In addition to various modifications to the interior, the Evanses also had the front entrance altered to eliminate the conical roof on a two-story stair tower to the right of the entrance and to create an outdoor tiled terrace on the second floor, labeled a “plant bay” on the plans. 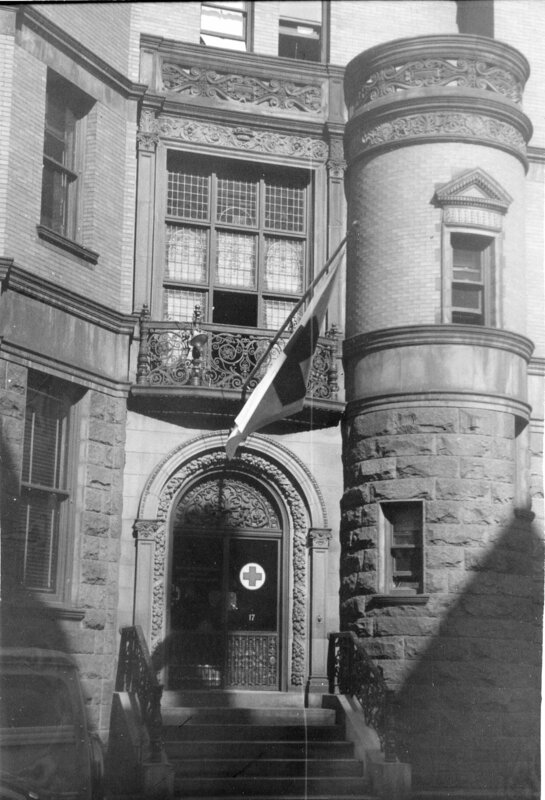 A wrought iron balcony also was installed above the front entrance, accessed through the original window on the stair landing between the first and second floors, called a “plant balcony” on the plans. Plans for the remodeling are included in the Peabody and Stearns Collection in the Boston Public Library’s Arts Department (reference PS/MA.055). The drawings include floor plans for each floor and a drawing of the modified front entrance and interior stairs. Click here to view the architectural plans for the 1901 remodeling of 17 Gloucester. While the remodeling was being completed, the Evanses lived temporarily at The Empire at 333 Commonwealth (they were listed at both The Empire and 17 Gloucester in the 1902 Blue Book). They had lived at 20 Gloucester, across the street, during the 1900-1901 winter season. They also maintained a home at Woodberry Point in Beverly, which was leased by President Taft as a summer home in 1909. Living with Robert and Maria Evans were her mother, Antoinette (White) Hunt, the widow of David Hunt, and Maria Evans’s sisters, Abby W. Hunt and Belle Marinda Hunt. They previously had lived at 308 Beacon. Robert Evans died in July of 1909. Maria Evans continued to live at 17 Gloucester with her mother and sisters. Abby and Belle Hunt continued to live at 17 Gloucester and also continued to maintain a home in Beverly. Abby Hunt died in December of 1933. Belle Hunt continued to live at 17 Gloucester until her death in January of 1936. The house was not listed in the 1937 Blue Book and was shown as vacant in the 1936 and 1937 City Directories. With the death of Belle Hunt, 17 Gloucester was inherited from the Hunt estate by the Beverly Hospital Corporation. On December 21, 1937, the Beverly Hospital Corporation transferred 17 Gloucester to attorney Frank W. Lowe, Jr.
On December 31, 1937, 17 Gloucester was acquired by the A. C. Ratshesky Foundation, founded by Abraham C. (“Cap”) Ratshesky and his wife Edith (Shuman) Ratshesky. Abraham Ratshesky and his brother, Israel, had been wholesale clothiers in the firm founded by their father, Asher Ratshesky. In 1895, they became bankers, founding the United States Trust Company, which specialized in the needs of the immigrant population, providing banking services not otherwise available to them in Boston. Abraham served as President and Israel served as Treasurer of the bank. Abraham Ratshesky’s wife, Edith, was the first cousin of Israel Ratshesky’s wife, Theresa. Abraham Ratshesky had served as a member of the Massachusetts State Senate from 1892 to 1894, and as US Minister to Czechoslovakia from 1930 to 1932. He was a founder of Beth Israel Hospital in 1916, and led Massachusetts’s efforts to aid the victims of the massive December 6, 1917, explosion in Halifax. He and his wife lived in an apartment at 65 Commonwealth and at their home, The Birches, in Beverly. Immediately upon acquiring the property, the A. C. Ratshesky Foundation donated 17 Gloucester to American National Red Cross. The donation was subject to the building’s continued use by the local chapters of the Red Cross, and was made in memory of Julia (Adams) Shuman (Edith Ratshesky’s mother), Rebecca (Ratshesky) Morse (Abraham Ratshesky’s sister, the wife of Jacob Ruben Morse), and Fanny Ratshesky (Abraham Ratshesky’s mother). The Red Cross chapter previously had been located at 347 Commonwealth, which also had been donated to them by the A. C. Ratshesky Foundation. 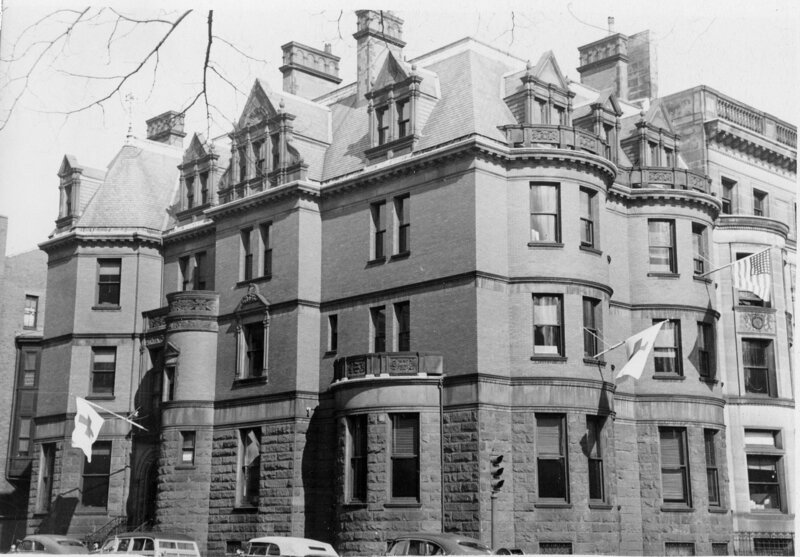 The Red Cross moved to 17 Gloucester in October of 1938. In October of 1940, the Red Cross added 273 Commonwealth, next door, as an annex to its offices. On May 20, 1971, 17 Gloucester and 273 Commonwealth were acquired from the American Red Cross and the A. C. Ratshesky Foundation by Andrew Shenk. 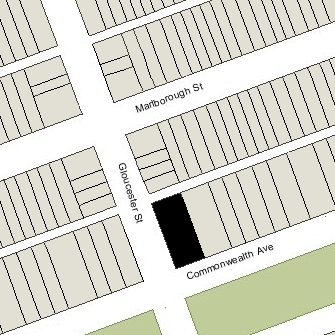 On September 12, 1972, Charlotte Goodman took possession of 17 Gloucester and 273 Commonwealth through foreclosure of her mortgage to Andrew Shenk, and sold both properties on September 27, 1972, to Richard George and Mitchell George. Richard George and Mitchell George subsequently converted 17 Gloucester into eleven apartments and 273 Commonwealth into twelve apartments. On December 19, 1975, they entered into a mortgage on 17 Gloucester with Lester Werman, Mark R. Werman, Ralph Werman, and Inez (Werman) Levenson. On June 7, 1976, the Wermans foreclosed on the mortgage and Lester and Mark Werman took possession of the property. Richard and Mitchell George retained 273 Commonwealth. On March 10, 1978, Edward Lorden DeMore purchased 17 Gloucester from the Wermans. In May of 1978, Edward DeMore’s company, Lorden & Co., filed for (and subsequently received) permission to remodel the apartments and reduce the number from eleven to nine. 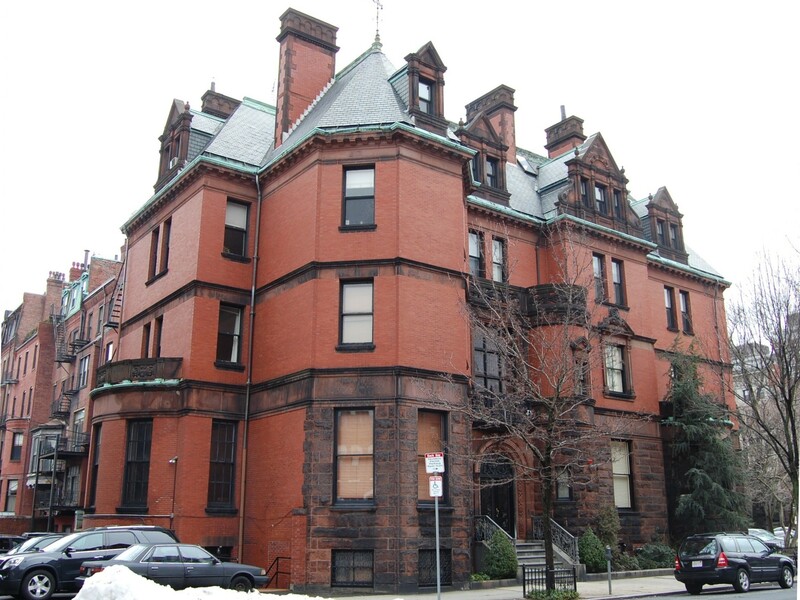 On June 27, 1978, Edward DeMore converted the property into nine condominium units, the 17 Gloucester Street Condominium. On June 8, 2018, the condominium unit owners amended the master deed to increase the number of units to ten, reflecting reconfiguration of two previous units into three units.